Dr. Venkateshkumar "Venky" Prabhakaran, 2016 M.T. Thomas Award for Outstanding Postdoctoral Achievement. Congratulations to Dr. Venkateshkumar "Venky" Prabhakaran, Pacific Northwest National Laboratory, on garnering the 2016 M.T. Thomas Award for Outstanding Postdoctoral Achievement. The award is given by the Environmental Molecular Sciences Laboratory, a DOE Office of Science user facility located at Pacific Northwest National Laboratory. He was selected because his postdoctoral work. This work is directly relevant to EMSL's mission of providing unique capabilities “for discovery and technological innovation in the environmental molecular sciences to support the needs of DOE and the nation.” In addition, his creativity, productivity and collaboration distinguish him as an outstanding postdoctoral researcher. 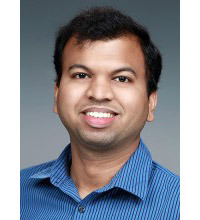 Prabhakaran's accomplishments include development of a multimodal imaging platform, a co-author of 21 research articles including 2 in high-impact publications (Proceedings of the National Academy of Sciences USA and Nature Communications), recipient of three PNNL outstanding performance awards, and other collaborative achievements both within and outside PNNL. EMSL presented the first M.T. Thomas Award in 1996 in honor of Dr. M. Tom Thomas, who served in various leadership capacities as the project progressed from conceptualization to realization. EMSL will formally honor Prabhakaran at a ceremony Sept. 11 starting at 4 p.m. in the EMSL auditorium with a reception following in Dr. Bill's Bistro. This article is a summary of the full announcement from EMSL.